The two techniques in this book are actually opposites with the same goal; which is helping you achieve what you want in life. Both techniques use the Law of Attraction to some degree, the affirmations more so than the tapping. The Emotional Freedom Technique called tapping is mainly used to get your emotions under control so that you can focus more on the positive aspects of your life, use positive affirmations and ultimately achieve your goals. Sometimes you will use the tapping technique first especially if you are experiencing extreme difficulties. At other times you can go straight into using the affirmations. 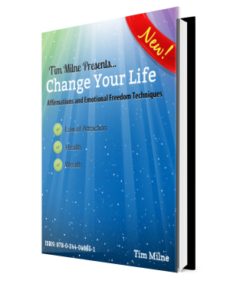 This book will help you on the way in obtaining peace of mind and any goals you may desire.